Background: Tetralogy of Fallot (TOF) with subarterial ventricular septal defect (VSD) is more common among Asians than Caucasians. Compared with the regular subaortic VSD postoperative right ventricular outflow obstruction is more common because of the sub-pulmonary extension of the defect. The objective of this study is to analyze the surgical implications and outcomes of patients with TOF - subarterial VSD in the current era. Patients and Methods: In all, 539 consecutive operated patients with TOF from May 2005 to September 2012 were retrospectively reviewed. Eighty-five patients had subarterial VSD. Seventy-nine of these underwent intracardiac repair. Preoperative clinical, echocardiographic features, operative and postoperative variables were assessed. Results: The median age at surgery was 6 years and the median weight was 14 kilograms. The male to female ratio was 1.7:1. TOF with subarterial VSD was associated with frequent use of transannular patch (74.6%). The early mortality was 2.5%. Follow up was 92% complete with a mean duration of 20 months with actuarial survival of 97.3% at 5 years. Two patients required reoperation for significant right ventricular outflow tract obstruction (RVOTO) at one year and three years, respectively. Conclusions: Intra cardiac repair for TOF with subarterial VSD has low perioperative mortality and morbidity. Transannular patch augmentation of the right ventricular outflow tract (RVOT) is required in a significant proportion of these patients. Precise suturing of the VSD patch, adequate infundibular resection and lower threshold for a transannular patch placement ensures a smooth early postoperative recovery. Tetralogy of Fallot (TOF) accounts for 15% of all congenital cardiac anomalies. In 6-8% of patients with TOF, VSD is observed in subarterial location. This particular subset of TOF is more frequently seen in the Asian population, where it has been noted in 10-20%. , TOF with subarterial VSD presents unique operative findings and the surgical strategy requires modifications. The aim of this study is to present our experience with TOF with subarterial VSD, its surgical implications and the surgical outcome. The case records of all consecutive patients with TOF operated from May 2005 to September 2012 were reviewed. Patients with subarterial VSD who underwent intracardiac repair were included in this review. Patients who were palliated with systemic to pulmonary artery shunt; those with pulmonary atresia, absent pulmonary valve and other associations like complete AV canal defect were excluded from the study. Patient characteristics and demographic data were analyzed. Age at presentation, oxygen saturation, symptoms at presentation and history of undergoing previous palliative shunts were noted. Preoperative echocardiographic features such as right ventricular outflow tract anatomy comprising the morphology of the infundibulum, the pulmonary annulus, size of main pulmonary artery (MPA), size of branch pulmonary arteries, associated aortic regurgitation and additional cardiac defects were studied. 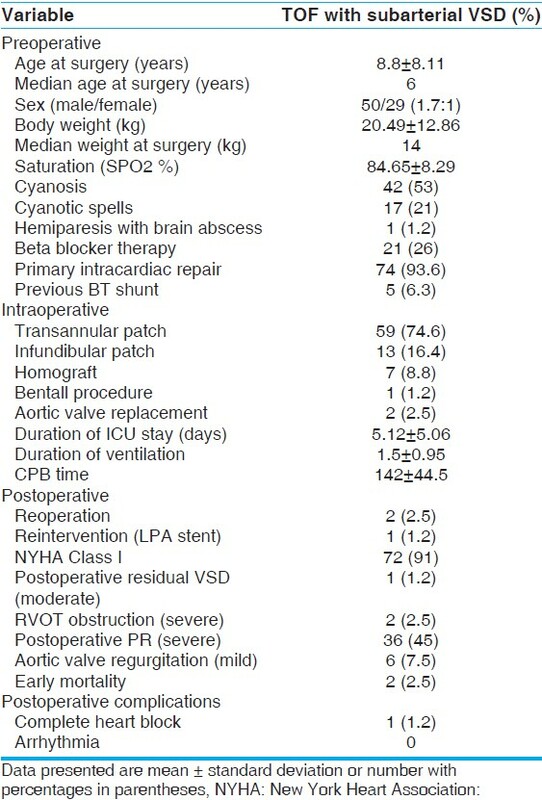 Operative variables analyzed included age and weight at surgery, cardiopulmonary bypass time, use of transannular patch, approach to close the VSD and homograft placement. The post repair pressure ratio between the right and the left ventricles (P RV /P LV ) was assessed. Postoperative variables included were duration of ventilation, ICU stay, mortality, duration of pleural drainage, echocardiographic assessment of pulmonary regurgitation in the immediate postoperative period and on follow-up. The incidence of aortic regurgitation on late follow up was also reviewed. The incidence of reoperations and reinterventions, arrhythmias requiring medication and NYHA functional classification at the latest follow-up were also studied. Representative preoperative, operative, and postoperative variables are summarized in [Table 1]. The operation was performed on standard cardiopulmonary bypass with aortic and bicaval venous cannulation. Topical and core cooling to 22 to 28°C was used in addition to cold antegrade blood cardioplegia for myocardial protection. The VSD was closed through the trans-atrial, trans-pulmonary route. Following cardioplegic arrest, the right atrium was opened and the intra cardiac anatomy assessed. The margins of the VSD were identified. The infundibular muscle resection was performed first to open up the RVOT. Following the resection of the obstructing septal and parietal bands, the main pulmonary artery was incised longitudinally. The incision was extended distally to an appropriate distance so as to widen any area of narrowing in the main pulmonary artery or its branches. The incision was then extended proximally across the annulus in the majority of the patients in whom a transannular patch was inserted. The proximal extent of this incision also crossed the pulmonary annulus in patients who needed placement of homograft conduit. In the remaining patients who required only an infundibular patch, the incision stopped short of the pulmonary annulus. The margins of the VSD were also assessed through this incision in the RVOT. The doubly committed nature of the VSD was also appreciated. 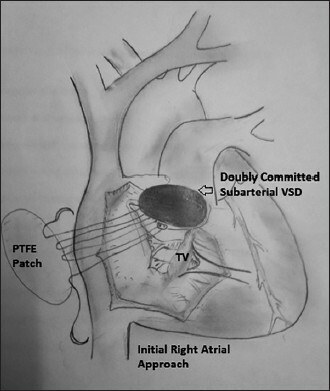 Through the right atriotomy, the VSD closure was begun [Figure 1]. An adequate-sized expanded polytetrafluoro ethylene (ePTFE) patch was prepared. The initial suture was seated at the anterior margin of the VSD and then passed through an appropriate site on the ePTFE patch. A pledget reinforced polypropylene (6 0' or 5 0') suture was used for this purpose. One arm of this suture was brought out through the RVOT incision. This arm of the suture was then continued along the pulmonary annulus taking horizontal mattress bites weaving the patch in the area at the base of the pulmonary leaflets. The patch was thereby firmly anchored to the pulmonary annulus at the superior margin. As the suturing approached the area of the aortic valve, particular care was taken to stay away from the leaflets because the leaflets lie in close proximity to the pulmonary annulus at this site. A few more bites would enable the surgeon to cross the area of the aortic annulus and enter the area of the posterosuperior margin of the VSD [Figure 2]. At all times, care was taken to ensure that the patch was not too redundant while at the same time maintaining adequate width to accommodate the aortic root and the left ventricular outflow. The suture was then passed into the right atrium where it was tagged. The remainder of the VSD was closed through the right atriotomy continuing the suturing using the other arm of the polypropylene. The VSD patch was trimmed to shape and size as the suturing progressed. The conduction bundle lay along the posteroinferior margin and care was taken to stay away from the edge of the defect at this area as in a regular perimembranous VSD closure. Posteriorly, the VSD patch was anchored to the base of the septal leaflet of the tricuspid valve. The previously created pulmonary arteriotomy was assessed. Hegar dilators were passed and a "Z" value of up to -2 was accepted to preserve the native annulus. This arteriotomy was extended as required across areas of stenosis in the branch pulmonary arteries or the pulmonary annulus to ensure a wide and open right ventricular outflow tract. A previously harvested patch of untreated autologous pericardium was used to reconstruct the right ventricular outflow tract taking care to ensure the patch was not unduly wide but sufficient to maintain an unobstructed flow into the pulmonary arteries. 5 0' or 6 0' polypropylene was used. Rewarming was begun and the operation was concluded in the standard manner after weaning the child off cardio pulmonary bypass. Adequacy of repair was verified by measurement of P RV /P LV and transesophageal echocardiography. Modified ultra filtration was performed in all patients to achieve a target hematocrit of 35% to 40%. Routine sternal closure was performed. Among the 539 consecutive patients with TOF seen in the study period, 79 patients of TOF with subarterial VSD underwent intracardiac repair. The male to female ratio was 50:29 (1.7:1). Age at surgery ranged from 8 months to 42 years with a median age of 6 years. The weight at surgery ranged from 6 kg to 59 kg with a median weight of 14 kg. Forty-two patients presented with cyanosis, out of which 17 had cyanotic spells. One patient presented with brain abscess and hemi paresis at the age of 3 years. The mean oxygen saturation at presentation was 84% with a wide range 63%-97%. Five patients had previous palliative (Blalock-Taussig shunt) procedure and 21 patients were receiving beta-blocker therapy prior to intracardiac repair. All patients fulfilled the criteria of hypoplastic infundibulum that involves extreme hypoplasia or virtual absence of infundibular septum. Main pulmonary artery was judged to be of adequate size for age in 35 patients, hypoplastic with severe supravalvar narrowing in 43 patients. Narrowed origin of both pulmonary arteries was noted in two patients, right pulmonary artery in two patients, and left pulmonary artery in 7 patients. Other associated cardiac anomalies included PDA in 20 patients, additional mid muscular VSD in one, multiple apical muscular VSD in three, atrial septal defect in four and partial anomalous pulmonary venous connection in one patient. One patient presented with situs inversus and dextrocardia. 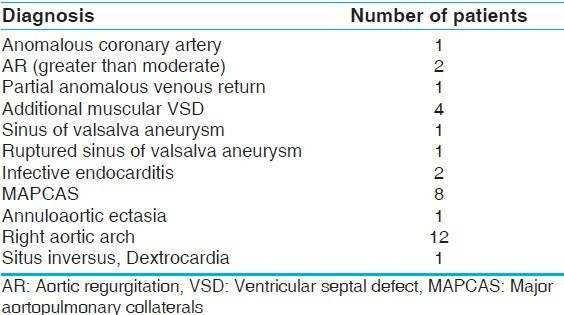 Twelve patients had right aortic arch [Table 2]. Aortopulmonary collateral arteries were identified in 14 patients by echocardiography, of which 8 were found to be major aortopulmonary collaterals (MAPCAS) by cardiac catheterization. Prolapse of the right coronary cusp (RCC) of the aortic valve was identified by echocardiography in seven patients of which two had severe aortic regurgitation. Two patients had Sinus of Valsalva aneurysm; one of which had rupture. Two patients had previous infective endocarditis with vegetation in the right ventricular outflow tract (RVOT) and destruction of the pulmonary valve. 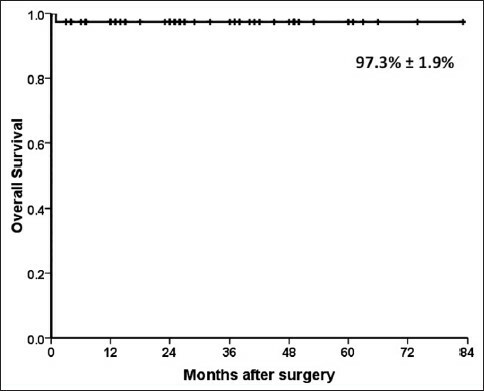 Of the 79 patients, 59 had transannular patch reconstruction of the RVOT (74.6%), 13 (16.4%) patients had infundibular patch alone and 7 (8.8%) required RV - PA homograft placement. Transesophageal echocardiography was performed in all patients prior to decannulation to confirm the adequacy of the surgical repair. One patient underwent the Bentall procedure with the intracardiac repair for associated ascending aortic aneurysm and severe aortic regurgitation. One patient underwent aortic valve replacement for severe aortic regurgitation. Unifocalization of MAPCA's was done in one patient, ligation of MAPCAS in three patients and coil embolization in four patients. The mean postoperative P RV /P LV was 0.47 ± 0.05. The mean duration of ICU stay and ventilation were 5 and 1.5 days, respectively. There were two early deaths (2.5%) due to low cardiac output state in the immediate postoperative period. Postoperative complete heart block occurred in one patient requiring permanent pacemaker implantation. None of the patients required re-operation in the immediate postoperative period. The follow up period ranged from 3 months to 60 months with a mean follow up duration of 20 months. Follow up was 92% complete. Actuarial survival was 97.3 ± 1.9% at 5 years follow up period [Figure 3]. On follow up, three patients had tiny residual VSD and one had moderate-sized VSD with RVOT obstruction on long-term follow up. Two patients required reoperation. One patient was operated at one year for moderate-sized residual VSD and severe RVOT obstruction due to muscle bundle at the septal side of RVOT. The second patient was operated after 2 years due to obstructive muscle bundle near infundibulum. She had undergone infundibular resection and pulmonary valvotomy, but now 3 years later she was still found to have infundibular aneurysm with thickened membrane causing obstruction. One patient required stent placement in the left pulmonary artery for origin narrowing at two years of surgery. The overall freedom from reoperation was 95.8% ± 2.9% at 24 months and 90.7% ± 5.6% at 48 months [Figure 4]. Twelve patients have mild RVOT obstruction and seven have moderate RVOT obstruction on follow up. These have been managed conservatively. 36 patients have severe pulmonary regurgitation while 11 and 19 have moderate and mild degrees of pulmonary regurgitation respectively. Six patients have mild aortic regurgitation on follow up. None of the patients have evidence of malignant arrhythmias on follow up; 91% are in NYHA class I functional class. TOF with subarterial VSD has unique high geographic prevalence around eastern Asia. The incidence of TOF with subarterial VSD in Japanese patients is 10-20% compared to 6-8% in western population. , Our study reports an incidence of 16%. This could potentially be the result of a referral bias favoring relatively less hypoxic children. There is no data to assess the incidence in the Indian population. The morphological feature of the doubly committed ventricular septal defect is the absence of muscular sub-pulmonary infundibulum. There is in addition, extreme hypoplasia or virtual absence of infundibular septum. This contributes to the formation of the hypoplastic infundibulum. In these instances the VSD is subarterial. The aortic and pulmonary valves are separated by a thin band of fibrous tissue and there is often hypoplasia of pulmonary annulus. The failure of formation of these structures causes the facing leaflets of the aortic and pulmonary valves to be in fibrous continuity, producing the fibrous raphe that form the superior rim of the defect. Patients with TOF and subarterial VSD are more prone to develop residual obstruction at the pulmonary annular level than those with the regular perimembranous VSD. It has been a subject of debate as to whether this entity can be included in the spectrum of TOF because the traditional definition required the leftward and anterior deviation of the infundibular septum, which is absent here. As the anterior displacement of the fibrous raphe between the arterial valves produces hemodynamic characteristics consistent with TOF with infracristal VSD, this entity is generally categorized as a Tetralogy variant. This entity has a relatively benign natural course. These patients have lower incidence of cyanotic spells, they have better pulmonary blood flow and higher oxygen saturations and have well developed pulmonary arterial tree when compared with TOF with conoventricular VSDs. , This is presumed to be related to the absence or deficiency of part of the anteriorly displaced infundibular septum, which prevents the development of fixed obstruction in the RVOT and allows better growth of the pulmonary artery and its branches. The mean oxygen saturation at room air in our patients was 85% with only 53% having cyanosis and 21% with cyanotic spells. It is known that an isolated subarterial VSD is associated with prolapse of the right coronary cusp of the aortic valve causing aortic regurgitation. Prolapse of the aortic valve is uncommon in TOF with subarterial VSD. However, the fate of the aortic valve unsupported by the muscular infundibulum following repair is not known. Our study shows a 9% (n = 7) incidence of prolapse of the right coronary cusp and a 2.5% incidence of significant aortic regurgitation. Ando et al.,  suggest that aortic regurgitation with TOF is also caused by annular dilation that exists before surgery. In TOF however there is an increased prevalence of late onset aortic regurgitation and they postulate that fixation or plication of the aortic valve annulus adjacent to the right coronary cusp caused by ventricular patch placement interferes with growth of this leaflet. Consequently the leaflets may become asymmetrical and eventually develop prolapsed leading to regurgitation with somatic growth. They also found that the size of the VSD patch plays a large role in the development of RVOT obstruction. An oversized VSD patch results in RVOT obstruction due to redundancy. 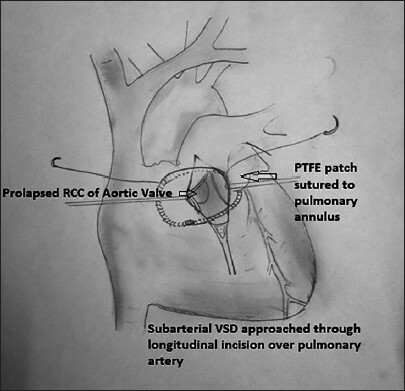 Accurate suturing of an adequate-sized VSD patch at the distal pulmonary end with sutures confined to the pulmonary valve annulus is the key to preventing this phenomenon. We have employed the trans-pulmonary approach to the distal end of the VSD patch wherein it is possible to visualize the aortic valve and thus stay comfortably away from the leaflets during this stage of the VSD closure. The VSD patch at the region of the pulmonary valve annulus is reinforced with pericardial pledgets to lend strength to the suture line. The VSD patch is trimmed when the posterior margin of the VSD is being closed and this keeps the VSD patch to the required size and thus prevents an oversized patch being placed. The severity of RVOT obstruction depends upon the degree of pulmonary valve stenosis, of the septal and anterior muscle hypertrophy and/or hypoplasia of the distal pulmonary arterial tree. Four patients had residual VSDs that were detected on immediate TEE post CPB and was not considered significant due to the small "tiny" size of these. However in one patient the "tiny" VSD increased in size and this was picked up on follow up. Despite the benign course and less severe anatomy, the prevalence of unresolved pulmonary stenosis and resultant poor outcome is quite high if the RVOT is not properly enlarged. , The attenuated limb of the septal band usually merges posteriorly with a thin ventriculoinfundibular fold in TOF with subarterial VSD. Fibrous continuity may exist between tricuspid and aortic valves (total conal defect). Consequently, the ventricular septal plane or the right ventricular inflow axis crosses perpendicular to the outflow axis. On an angiogram the subarterial infundibulum protrudes into the right ventricular outflow in an anteroposterior projection, which Kurosowa et al., call "beak-neck" shadow. Therefore an oversized ventricular septal patch or a redundancy at the distal end of the patch may result in further obstruction of the right ventricular outflow tract (RVOT). Infundibulectomy is confined to the parietal wall side of the RVOT at this level and has to be done generously to avoid a long transannular patch placement. RVOT gradients in the range of 30-40 mm Hg was considered mild, 40-50 mm Hg was considered as moderate and more than 50 was considered as severe RVOT obstruction. One patient in our study who had severe residual RVOT obstruction with infundibular aneurysm had fixed obstruction at the distal end of the patch probably due to an oversized ventricular septal patch. Anterior and posterior ends of the fibrous tissue between the aortic and pulmonary annuli merge with attenuated limbs of the septal band. Suturing of the VSD patch is especially difficult at these points both from the right atrium and the pulmonary artery because of the sharp angled turn. It is known that the closure of the subarterial VSD increased the apparent severity of pulmonary stenosis necessitating a transannular patch. , In the absence of pulmonary annular hypoplasia, transannular patch placement is unnecessary and the patch placement may be limited to augmentation of the sub-pulmonary area of the RVOT, which gets narrowed after placement of the VSD patch. In contrast others report that the pulmonary annulus size is similar to TOF with infracristal VSD and that transannular patch placement is almost mandatory. The prevalence of transannular patch in our study was also 74.6%. Although a high post repair P RV /P LV ratio is a well known determinant for early and late death in Tetralogy, severe pulmonary regurgitation caused by an excessively large transannular patch is likely to cause RV dysfunction after repair. In our study though 46% had severe pulmonary regurgitation, none developed right ventricular dysfunction in our limited period of follow up. Presently we preserve pulmonary annulus (intraoperative measurement with Hegar dilator) with z-value of more than -2 in our current practice, even though it is subjective. Hence the more liberal use of transannular patch and extensive infundibulectomy were justified. The limitation of this study include that this is a retrospective study and the follow up duration is somewhat limited (< 5years). It is also a single center experience. 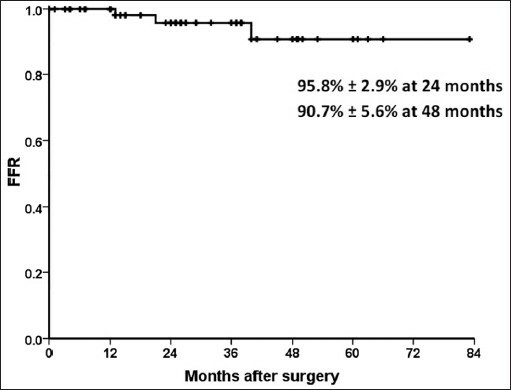 In our observation, corrective surgery in TOF with subarterial VSD has low perioperative mortality and morbidity. Excellent intermediate term outcome can be expected after repair of TOF with subarterial VSD and is associated with good functional outcome. The present study was consistent with other reports demonstrating that residual RVOT obstruction was the main reason for re-operation in TOF with subarterial VSD and that transannular incision was required in a significant proportion of patients. Precise suturing of the distal end of the ventricular septal defect patch, extensive infundibulectomy, lower threshold to place a transannular patch, and the usage of an adequate-sized ventricular septal patch prevent adverse outcomes. Neirotti R, Galindez E, Kreutzer G, Rodriguez Coronel A, Pedrini M, Becu L. Tetralogy of Fallot with subpulmonary ventricular septal defect. Ann Thorac Surg 1978;25:51-6. Oguni H, Satomi G, Yamada Y, Hatano T, Nakamura K, Takao A. Two-dimensional echocardiographic diagnosis of tetralogy of Fallot with a total conus defect. J Cardiogr 1983;13:649-59. Ando M. Letter: Subpulmonary ventricular septal defect with pulmonary stenosis. Circulation 1974;50:412. Jacobs ML. Congenital heart surgery nomenclature and database project: Tetralogy of Fallot. Ann Thorac Surg 2000;69:S77-82. Wilcox BR, Cook AC, Anderson RH. Lesions with normal segmental connections: In: Wilcox BR, Cook AC, Anderson RH, editors. Surgical Anatomy of the Heart. 3 rd ed. Cambridge: Cambridge University Press; 2004. p. 169. Okita Y, Miki S, Ueda Y, Tahata T, Sakai T, Matsuyama K, et al. Early and late results of repair of tetralogy of Fallot with subarterial ventricular septal defect. A comparative evaluation of tetralogy with perimembranous ventricular septal defect. J Thorac Cardiovasc Surg 1995;110:180-5. Griffin ML, Sullivan ID, Anderson RH, Macartney FJ. Doubly committed subarterial ventricular septal defect: New morphologic criteria with echocardiographic and angiographic correlation. Br Heart J 1988;59:474-9. Anderson RH, Allwork SP, Ho SY, Lenox CC, Zuberbuhler JR. Surgical anatomy of tetralogy of Fallot. J Thorac Cardiovasc Surg 1981;81:887-96. Carpenlle H, Somerville J. Atypical Fallot's tetralogy with doubly committed subarterial ventricular septal defect. Diagnostic value of 2-Dimensional echocardiography. Am J Cardiol 1983;51:282-5. Tatsuno K, Konno S, Ando M, Sakakibara S. Pathogenetic mechanism of prolapsing aortic valve and aortic regurgitation associated with ventricular septal defect. Anatomical, angiographic, and surgical considerations. Circulation 1973;48:1028-37. Kurosawa H, Yanagisawa M, Kainuma Y, Koyanagi H, Imai Y. Tetralogy of Fallot with total conus defect - some morphological and surgical problems. Kyobu Geka 1976;29:229-38. Ando M, Takahashi Y, Kikuchi T, Tatsuno K. Tetralogy of fallot with subarterial ventricular septal defect. Ann Thorac Surg 2003;76:1059-64. Vargas FJ, Kreutzer GO, Pedrini M, Capelli H, Rodriguez Coronel A. Tetralogy of Fallot with subarterial ventricular septal defect. Diagnostic and surgical considerations. J Thorac Cardiovasc Surg 1986;92:908-12.
de Leval MR, Pozzi M, Starnes V, Sullivan ID, Stark J, Somerville J, et al. Surgical management of doubly committed subarterial ventricular septal defects. Circulation 1988;78 (5 Pt 2):III40-6. Ilbawi MN, Idriss FS, DeLeon SY, Muster AJ, Gidding SS, Berry TE, et al. Factors that exaggerate the deleterious effects of pulmonary insufficiency on right ventricle after tetralogy repair. Surgical implications. J Thorac Cardiovasc Surg 1987;93:36-44.